Non-pawn pieces that become captured, are retained by the capturer—unrotated—in an off-board "stock". It may move two steps straight forward, or two steps diagonally forward, in a single move, and at any stage (on its initial move, and on any subsequent move). The two squares must be unoccupied; the pawn may not "jump" over an intervening piece. It does not promote when reaching the last rank. There is no en passant capturing in Cubic Chess. Try out this great game of Cubic Chess yourself. Vladimir has developed other closely related games in addition to Cubic Chess, such as Cubic Checkers. Cubic Checkers is a game for two players. 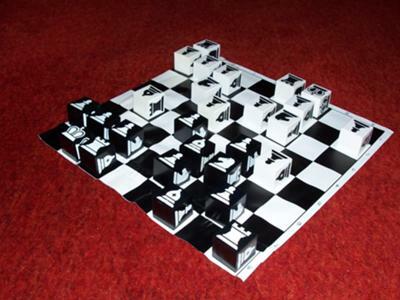 The game is played with eight white and eight black cubes on a chess board of 8x8 squares. Sides of a cube contain the symbols rook, bishop, knight and pawn. The symbol on the top side of a cube determines it's power, not it's mobility. Every cube can move along diagonals over any number of squares, forward or backward. While a player has not moved a rook, he or she cannot jump across their opponent's cubes. After a rook is moved, jumping is obligatory. If a cube's path is blocked by an opponent's cube and the player can jump, he jumps across the opponent's cube to any empty square behind it. The cube that was jumped across is rotated so that it changes it's value as follows: a rook is changed into a bishop, a bishop is changed into a knight, a knight is changed into a pawn and a pawn is removed from the board. If the cube, which jumps in this move, can still jump across another opponet's cube, it must jump across it too. No cube can be jumped across more than once during a move to avoid cycling. If a player has more than one possible jump, he must choose the move with the maximum number of opponent's cubes to jump across. When a cube completes it's move, the cube is turned through 90 degrees along the vertical axis to a laying position. It means the cube is pausing and it cannot move in next move. A cube which paused in previous move is turned back to active position. The winner is the player whose opponent has only three cubes on the board. The game is a draw if both players have moved consecutively ten times without jumping across any cube. Apologies Vlad. I fixed that. (Not possible to play and use an artificial intelligence).